Kaelos speaks with Shiftstoned about her unconventional approach to deck-building on the heels of a first-place finish in an ECL weekly event. Science, community and the healing power of games are just a few of the topics that emerge from our conversation about Power bases in Eternal. camat0 sits down with Shiftstoned to discuss the Power bases behind all four of his winning lists from the Eternal Community League’s inaugural Sunday Challenge event. We talk Power, Crests, fixing and the merits of Privilege of Rank. Back in May, I blogged about reaching Shadow level 100 after some friends and fellow Eternal players were asking me what the rewards were. More recently I also reached Level 100 in Time and kind of forgot about it until someone mentioned it again. They wanted to know if I was the first to reach Level 100 in any faction. I honestly don’t know the answer to that question, but I’m not aware of anyone else who has documented it. As with Shadow Level 100, reaching Time Level 100 will earn you…an Omens of the Past pack. I’ve heard a rumor that some enhanced rewards for Level 100 Faction Progress are in the works (possibly a Totem, or Totem upgrade?) so I’m looking forward to seeing whatever those may be. Meanwhile, the reward for Level 90 was actually more interesting: a Marisen deck image. Speaking of Marisen, I was intrigued to read about her appearance at the throne room duel between Eilyn and Kaleb that was documented in the latest chapter of Eternal lore. Some had speculated that Kaleb killed Marisen after their confrontation at the Praxis Aracnum during the Empty Throne campaign. That never seemed quite right to me, so I was glad to see those rumors put to rest. Now, about those Fire, Justice and Primal levels…still have some ground to cover there. Just speculating here, but I’m hoping for some Worldpyre Phoenix, Jarrall Iceheart and Marshal Ironthorn deck images. Two distinct and innovative archetypes prevailed at recent Eternal competitive events. Tobboo’s Rakano Valkyries showcases a new breed of Midrange Rakano, while Isochron’s Adapted Green Feln presents a fresh take on J/PS Control. 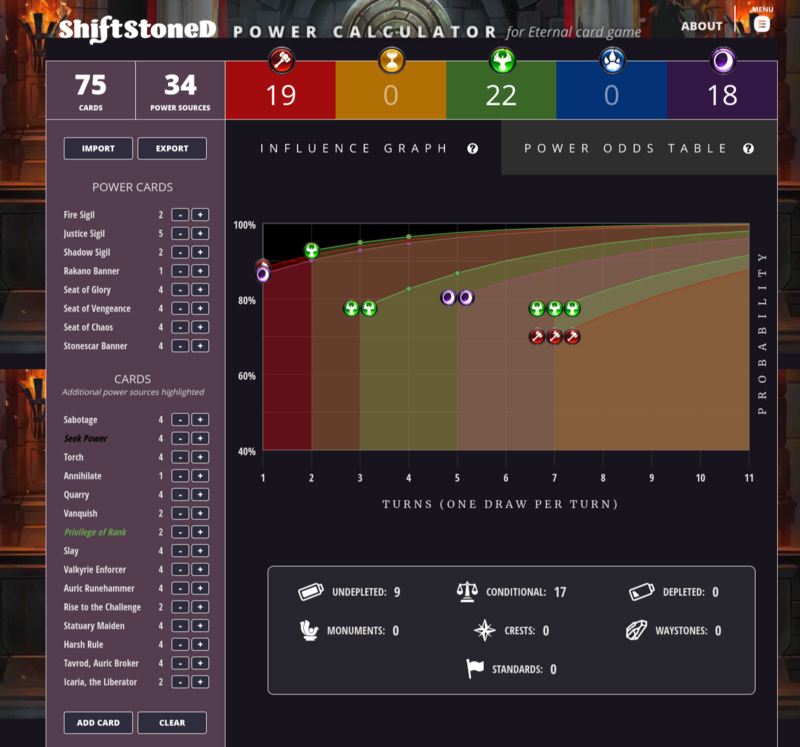 This article takes a look at their power bases using the Eternal Power Calculator. with an aggressive Combrei list entitled Rakano’s weapons are outmatched!